Photo caption: Vice Chairman of Summit Group Latif Khan along with Managing Director Eng Mozzammel Hossain and Project Head Engr Abdul Hakim of Summit Gazipur I & II Power received the award for the Fast-Track Power Plant of the Year in recognition as one of the fastest implemented power plants in the world at Asian Power Awards 2018 in Jakarta, Indonesia. 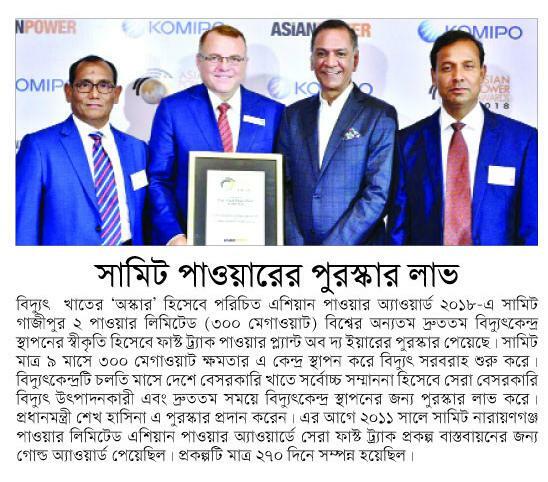 At the annual event of Asian Power Awards, also known as the “Oscar of the Power Industry” Summit Gazipur II Power Limited (300 MW) was awarded the “Fast-Track Power Plant of the Year” in recognition as one of the leading fast-track power plants in the world. Summit had completed construction-to-power generation of this 300 MW power plant only in nine months. For the same power plant, earlier this month (September 2018) at the “Power & Energy Week 2018” Summit was awarded the prestigious “Best Private Power Generation Company” in recognition of fastest implemented power plant in the Bangladesh by the honourable Prime Minister Sheikh Hasina. In 2011, Summit Narayanganj Power Ltd (105 MW) was awarded the Gold Award at Asian Power Awards 2011 for Best Fast-Track Power Project for implementing construction-to-generation in 270 days.